No modern material fully replaces the traditional wooden floor. True, its installation is fraught with some difficulties (the need for proper selection of wood for logs, their strictly horizontal installation, careful adjustment of floorboards), but there is still no alternative to wood flooring. The wooden floor has always been highly valued. It is natural, attractive and safe. It would seem that the floorboards can be placed directly on the aligned screed, however, logs are necessary in order to sufficiently ensure normal floor ventilation and the most optimal heat exchange in the room. Of course, laying a perfectly level screed will simplify the task of installing a floor lag, so the very first preparatory work for constructing a wooden floor should be the maximum leveling of the base. As for the question of how to fix logs, it should be said that not every type of wood is suitable for their manufacture. Coniferous trees are the best material for them: spruce, fir, pine and larch. As a rule, material with a section in which the aspect ratio is 1: 1.5 goes to the bars. In addition, before you start fixing the log, the boards and bars should be thoroughly dried. The moisture content of wood should not exceed 20%. 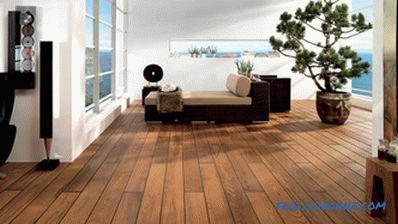 It should be noted that the installation of wooden floor is advisable only in rooms with high ceilings. For installation, the lag will require a hacksaw, a construction level, a screwdriver, self-tapping screws, a construction pencil, etc. 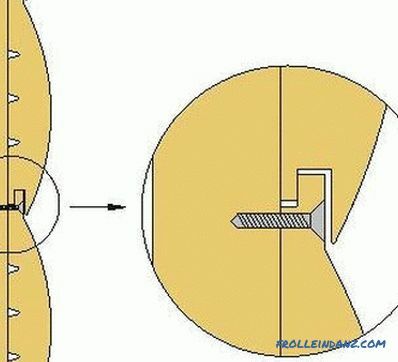 self-tapping screws with a cross section of 6 mm with plastic dowels (plugs should be driven into concrete by 6-8 mm, and the length of the fastener depends on the thickness of the bars) or anchors intov whose size in the same heavily dependent on cross-section beam. 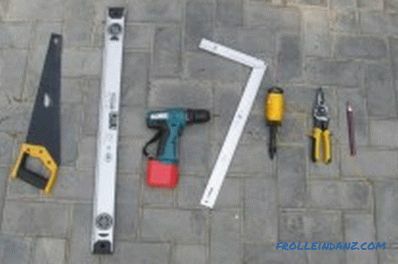 The choice of fasteners depends on your preferences and the wallet thickness, but it must be said that anchoring is much more reliable than dowel, since the anchor shank when screwing into the concrete body breaks its sleeve and fixes the fixture tightly. 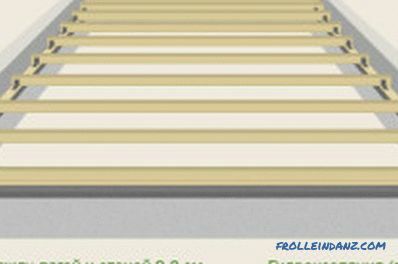 Nevertheless, it is often enough to use polypropylene dowels with self-tapping screws for fixing the floor log, since most coatings do not have to experience extreme mechanical loads. Roofing material is required for waterproofing. antiseptic compounds (you can always find in the store and multi-functional tools that will significantly speed up the process of processing the bars). You should stock up with pieces of plywood, chipboard or wood, which may be needed as linings for the floor to level the plane. Laying pattern of the lag on the concrete base. Ensure that the concrete screed is dry and primer it. Lay a waterproofing pad on the screed. Its adjacent sheets should be laid with an overlap of 10 cm. 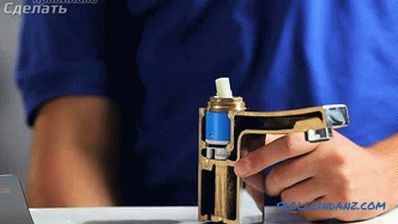 The edges of the vapor insulator tapes should be glued with a bitumen compound or tape (depending on the material of the water-repellent membrane). Treat the bars with an antiseptic. Cut the logs according to the size of the room and distribute them over the floor surface. It is desirable that only 1 timber is used for each lag. 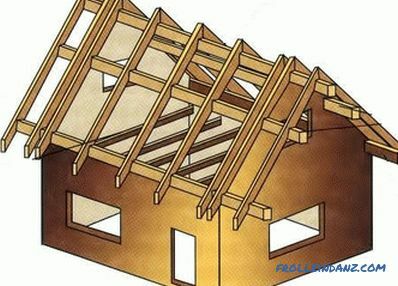 Joints are allowed for large room sizes when the length of the beam is not enough. 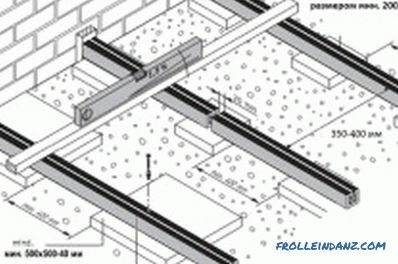 The location of the joints on adjacent beams should not be the same. They should be spaced relative to each other by at least 0.5 m. There must be a support under the joints. 2 extreme lags lay against opposite walls. Remaining bars should be perpendicular to them. The distance between adjacent lags depends on the thickness of the flooring. The step range ranges from 40 to 100 cm (more on this below). Secure the extreme lags. With the help of a hydraulic level and a whip cord, install the extreme bars. Drill holes in them and in the concrete base, insert the fasteners and fix the logs in the concrete. The mounting pitch with self-tapping screws is from 50 to 80 cm, and the anchor screws are screwed in after 1 m.
Attach transverse logs to the floor.For better orientation, stretch the cord between the outer bars. 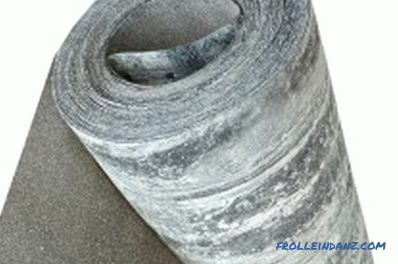 It is desirable that there are no linings under the bars, but in case of uneven screed, they cannot be dispensed with. Make sure the linings fit tightly in the space between the bar and the tie. If there is a bulge on the concrete base under the lag, lightly brush the edge of the timber adjacent to this place with a plane or chisel. Only when performing these procedures, the floor will no longer creak under your feet. The distance between the floor boards, depending on the thickness of the floor board. for floorboards 5 cm thick, the logs are mounted at a distance of 1 m from each other. Under the plywood floor, the distance between the lags is calculated somewhat differently. 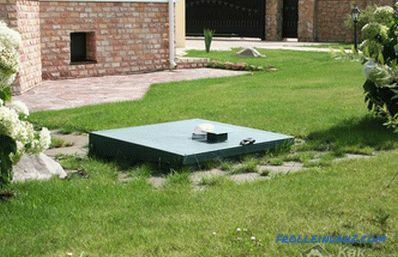 A step of 40 cm is sufficient for laying a 15- or 18-millimeter cover, and for 22-millimeter plywood a distance between the bars of 60 cm is suitable. After mounting the bars, you can fill in clay or place another insulator. Until the flooring is laid, any communication lines can be laid. Before installing the floor on the logs, it is desirable to lay a vapor barrier film. Laying the lag on the ground. There are cases when the boards under the floor have to be laid not on a concrete base, but on the ground. To fix the logs in a similar way, you must clean the soil from the top layer and carefully tamp it. It will be even better if the surface is covered with rubble. Layer backfill can be up to 5 cm. After leveling rubble waterproofing is laid on the ground. On the walls of the building it is necessary to mark the horizon along which the lags will be installed. Marks are made using a laser or water level and a whipping cord. In the first place bars are installed along 4 walls. Lags are placed on stands made of bricks, boards or other materials. 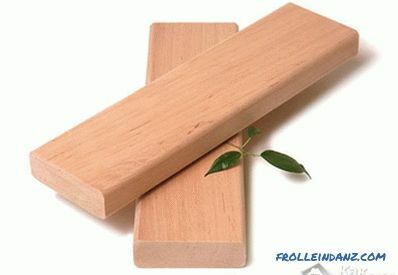 All wood products should be treated with antiseptic compounds, and between the lags and props should be laid ruberoid. Between the brick stand and the floorboard should be a wooden strip. 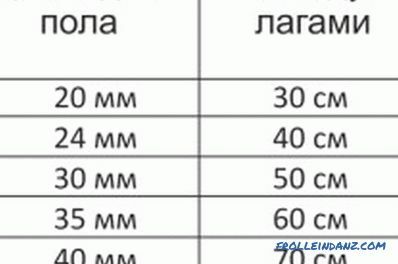 Its thickness can not be less than 25 mm. 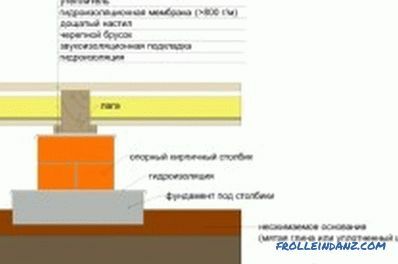 The distance between the extreme beams and the walls should be at least 2 cm. 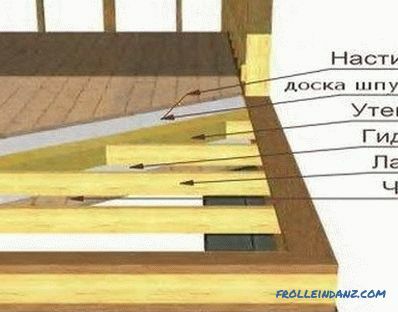 Between the opposite walls you can stretch the threads, which will serve as guidelines for the installation of bars. 6 m - 220 x 180 mm. Using a lag shorter than the length of the span when installed on the ground is highly undesirable. It is also necessary to tell about modern means of lag level adjustment. Manufacturers produce special racks that can change the height of the beams from 10 to 25 cm. Such devices are very useful when installing a wooden floor on an uneven base. They are racks with thread, fastened to the ceiling dowel-nails. Changing the height of the beam is carried out by screwing or unscrewing the threaded rod, fixed in the desired position by the lock nut. Support under the timber can be inserted into the holes drilled in his body. 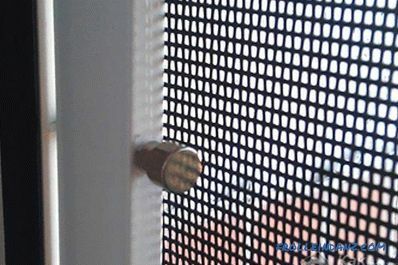 Often they are equipped with corners with holes through which screws are screwed into the lags. Despite the apparent complexity, the installation of the lag is not so difficult. If you do not violate the installation technology, the wooden floor for many years will serve without the slightest squeak and sagging of floorboards.